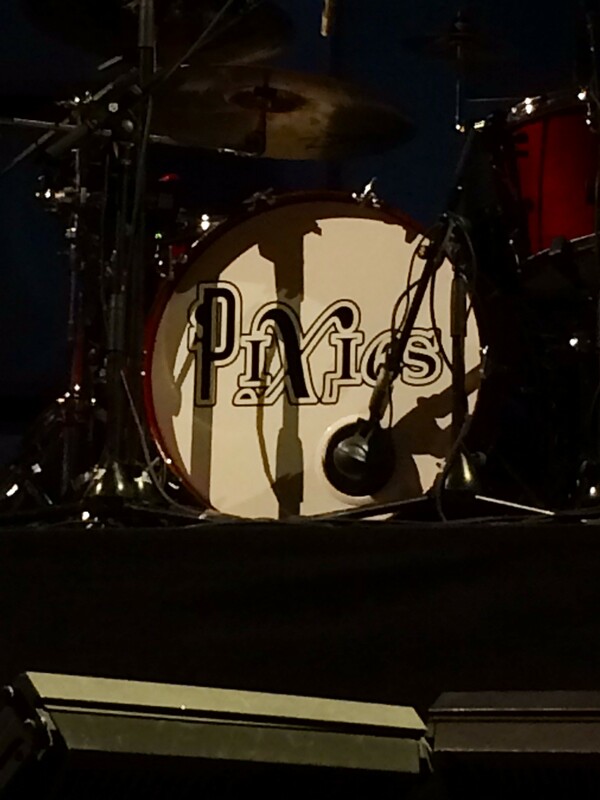 Frontman Black Francis and drummer David Lovering rock the INB Performing Arts Center Friday. They move onto the INB Performing Arts stage with purpose. At the most, there’s 30 minutes between the Pixies set and their openers, Royal Blood (a hard rock two-piece worthy of a listen). And here they are, just four people waving, bowing. Not once over the next 2-hour set will any of them say words that aren’t a part of their songs into their microphones. They are here to play music. Onward, they start up into “Wave of Mutilation,” Black Francis’ aging but still great voice soars over the auditorium. The crowd, filling around two-thirds of the room, loves it. While the venue has assigned seats, most people will stand throughout the set. 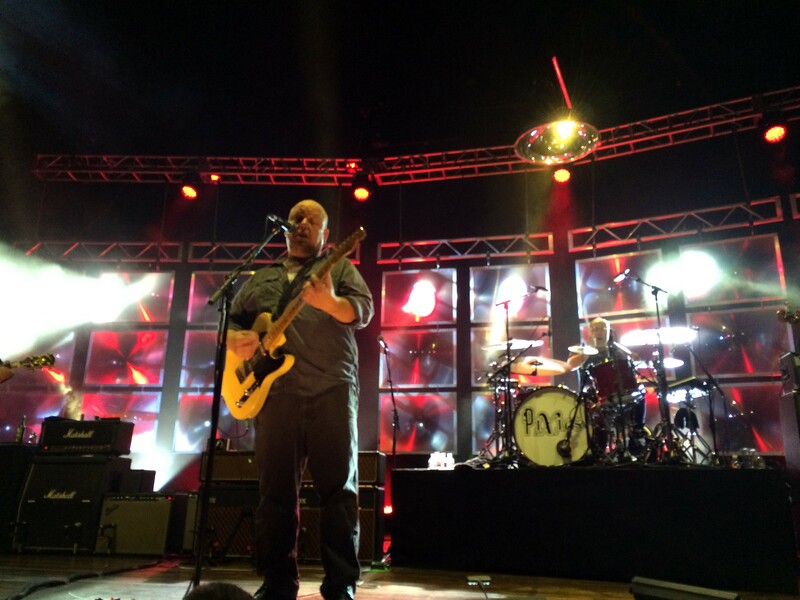 The best part about seeing the Pixies live is experiencing the beauty in how their songs work. Through the loud, scuzzed-out dissonance coming from the guitars and bass, melodies appear, tasty morsels that delight the ears. Before the show had begun, the superfan sitting next to me wondered if I’d ever seen the influential indie rockers before. After replying no, he explained I should have brought an extra pair of pants because “the music would make me poop my pants.” Thankfully, that didn’t happen, but the show did rock hard. Especially wonderful were “Ed is Dead,” when people got to really dance, “Nimrod’s Son,” when people got to shout, and “La La Love You,” when drummer David Lovering led the singing audience though the chorus. Things got funny when it was clear he wanted to end the song but the band just kept playing. Poor guy. — like “Indie Cindy,” “Bagboy” and “Greens and Blues” — fit in quite well with the rest of the set, even if less people seemed to be familiar with them. Kim Deal wasn’t there, that was very clear. But touring bassist Paz Lenchantin did everything she could to satisfy the role. To take over for someone so integral for the band must be daunting, but especially on wispy vocal harmonies, when she wasn’t singing alone, she did well. Often, though she just kind of faded into the background. Guitarist Joey Santiago smiled maybe once in the whole set. That came in the second-to-last song, “Vamos,” when he went to the center of the stage to wail on his instrument. He then took Lovering’s drumstick and started strumming his guitar with it. He threw the stick on the ground, it bounced back and he caught it. He threw the stick down and rolled his guitar stings over it on the ground. The madness was so awe-inspiring, he had audience members in front bowing down. Of course, you know what they ended with; it’s the song they had to end with — “Where is My Mind.” The audience swayed, and more cell phones were taken out to document this song than any other. After a 29-song set, it appeared we weren’t going to get an encore, but finally, the four-piece played one more song, a rollicking "Planet of Sound." They rode us hard and they waved and bowed and they were out of there. True professionals. If you wanted the Pixies to sound exactly like their albums, this show wasn’t for you. If you wanted the Pixies to sound like they did at the beginning of their reunion tour in the mid-2000s, this show wasn’t for you. If you wanted a damn good rock show with musicians dedicated to their craft, this was the show for you.